Foresight methodologies are good for planning long-term strategies and often used by forward-looking organizations and governments throughout the globe. SAIS 2 Programme Document speaks to promoting foresight activities to assist policy development and implementation at different levels of government. The approach aims to facilitate built-in learning, scalability, and replicability with multiple organisations within the public and private sectors able to take ownership and replicate programmes post SAIS. The collaboration with City of Windhoek and Demos Helsinki allowed foresight activities to be piloted in the urban context in one of the partner countries of SAIS 2 - Botswana, Namibia, South Africa, Tanzania and Zambia. Through this practical project SAIS 2 was able to promote foresight activities within Namibia. The lessons learned through this pilot can be utilised when replicating the activities in the region. Foresight is systematic thinking about the future. To do foresight is to imagine alternative futures by asking: What futures are possible? What futures are probable? What futures are desirable? Foresight is a useful tool for identifying long term targets (vision), actions and decision paths towards the targets for organisations. We do not do foresight to predict the future. We do foresight so that we can become actors and make better decisions today. The world is undergoing important shifts in the progress of a society. These megatrends affect every aspect of our lives, and decision-makers can make use of foresight to be active in the changing times, as opposed to reactive. If we did not have the ability to imagine the possibility of things being different, then we would not be actors – we would merely be reacting to things. Foresight help us see events on a timeline and create a story of what happens, how, and when. Foresight can therefore help us understand delays and the relationship between decisions and events, and our role in creating the future. See this short video by SITRA, the Finnish Innovation Fund to learn more. How does technological planetarism affect our societies, and what is a hyperconnected society? The City of Windhoek is the municipal authority of Namibia’s capital city and it recently launched a Youth Entrepreneurship Development Strategy (YEDS). The YEDS aims to address youth unemployment, and CoW is looking at fostering entrepreneurship as a viable strategy in responding to creating employment opportunities. Entrepreneurship is seen as an advantageous way to promote not only self employment but also skills leading to better employability amongst the youth once the provision of necessary assistance and support services to set up their businesses is in place. Namibia is a country with a youth unemployment range of between 37.8 % and 41.7% for youth ages between 15-35 years of age (NSA, 2015). Horizon Scanning: Mapping the relevant variables and actors. Define the opportunities and challenges. The CoW, Demos Helsinki project team and SAIS started the Foresight process in June 2018 by conducting a scoping exercise to map the existing stakeholders who deal with youth enterprise development in the city. All the scoping meetings followed the same pattern to allow for comparable data collection. They entailed interactive discussions aiming at understanding the CoW’s main activities, their role in the ecosystem, as well as their views on current trends and challenges in the context of youth entrepreneurship. The stakeholders shared best practices and success stories, and their views on potential areas of cooperation. The scoping visit in June 2018 concluded with a pre-workshop on defining the opportunities and challenges of the entrepreneurship ecosystem with the core team from the Economic Development Division (EDD). “In 2030, Windhoek has a blossoming entrepreneurship ecosystem that creates jobs, prosperity and opportunities – for all. to be made in order to get to the goal defined in vision. The group also identified who is responsible on delivering these actions. This was done with the method of backcasting, whereby the needed actions were tracked step by step going backwards from the vision all the way to today. Engaging with stakeholders in June allowed for commitment from key ecosystem stakeholders to actively contribute to the backcasting work. This offered a platform for encouraging collaboration and creation of opportunities between the actors in implementation. Together with other stakeholders the Economic Development Division (EED) created six tracks to form a roadmap of practical steps towards year 2030. One Stop Shop: Entrepreneurs use all relevant services through a One Stop Shop – both online and offline. Spaces & Infrastructure: Entrepreneurs have secure spaces for collaboration, production and sales. Capacity Building: Entrepreneurs have the necessary skills throughout their career and people want to become entrepreneurs. Access to Funding: Entrepreneurs receive necessary funding to thrive. 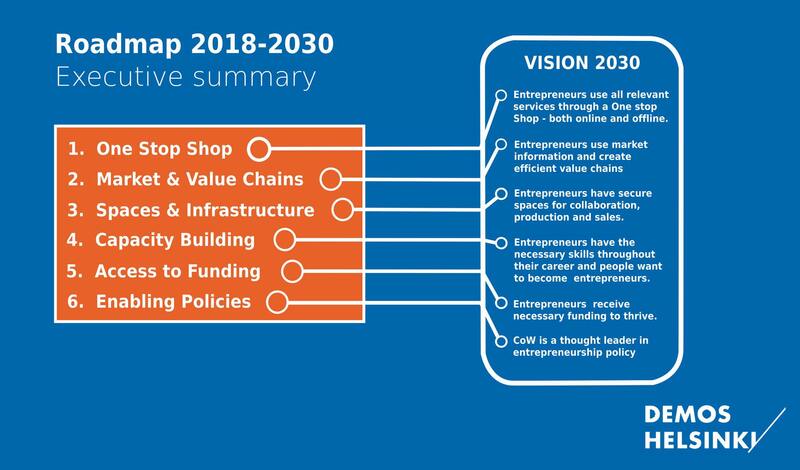 Enabling Policies: CoW is a thought leader in entrepreneurship policy. The 17 staff members of the CoW EED participated actively in the strategy work, and received certificates for having successfully undergone the training on Foresight methods and preparatory research methods. After the workshop week, CoW EED identified champions within the division to spearhead the implementation of projects within the six different tracks. Within one month of the Foresight workshop week, the EED took promising steps to initiate and finalise Memorandums of Understanding with some of the stakeholders who also participated in the Foresight process. City of Windhoek is following in the footsteps of other bold future-oriented organisations utilising foresight in strategy work. Demos Helsinki worked also in collaboration with Tanzania Commission of Science and Technology and National Planning Commission on how to create capabilities and use foresight and co-creation by conducting research project with a headline “the Future of Forests as a Resource for Tanzania”. Download the scenario report here to learn more! Also in South Africa, foresight’s usefulness in tackling industry-specific challenges has been identified. An article published in 2011 by The Council for Scientific and Industrial Research (CSIR) recognises technology foresight studies as one way to determine the future factors that will influence a specific economic sector. Read about how to approach conducting a technology foresight study within the South African construction industry. Municipalities have greatly benefited from Foresight tools in strategy work. In Finland, City of Espoo and S Group partnered to host an open innovation competition to transform Kera, an industrial and logistics area, into a future city area for living and work. Read more about the competition here! Is your municipality interested in applying Foresight to solve a pressing problem in an urban environment in Botswana, South Africa, Tanzania or Zambia? SAIS looks to replicate successful interventions at a trans-regional level, using lessons learned, expert facilitators and applying methods to suit the local context. Contact us to initiate discussions on how your organisation, city or town can benefit from the use of Foresight methodology.